WATCH THE 'TOUR OF ECHOES' VIDEO HERE. Barack Obama now makes the same walk, passing through the Virginia marble, baked brick and Maryland limestone innards of the Capitol, then taking in the National Mall’s panorama—due west of the Lincoln Memorial, north of the White House, south of the Anacostia waterfront. But he need not feel alone. In our collective memory of the inaugural path, the iconic civil rights marches of the 1960s loom large. But generations of African Americans have also quietly toiled in obscurity, paving the way for this moment. As Obama proceeds through the halls, surveys the stone, views the earth laid out around the inaugural landscape, he can take comfort and strength in the echoes of a long-ignored, often forgotten history. Before the inaugural ceremony, Obama enters the Capitol through the Crypt, the oldest section of the building. As author Jesse Holland described in Black Men Built the Capitol, slave owners hired out gangs of human property to clear timber, bake bricks, dig foundations and haul limestone. The Capitol, this temple of freedom, was rising from a hill, in two unconnected wings: House and Senate. The temple was erected by slaves. These forgotten people dug the ditches that drained groundwater from “Capitol Hill” into a fetid swamp, which later became known as a sewer called Tiber Creek. Today, this grassy area is known as the National Mall. The slaves sang as they swung shovels and picks. The echoes of these songs will ring within the crypt’s masonry as the Obama entourage proceeds past the Old Senate Chamber. This chamber was the site of debates and treaties which grew our nation from infant to toddler. It was also a room in which African Americans declined to act as barbarous as their masters—or indeed, supposed liberators. In August, 1814, a British invasion force swept aside an American army in Bladensburg, Md. and would have captured the president and much of the cabinet were it not for the heroism of black sailors and other freemen under the command of Commodore Joshua Barney. But other black people—slaves seeking freedom promised by the invaders—joined the British to fight, and they led the redcoats into an empty city. British soldiers and marines held a mock session of Congress in the Old Senate chamber, urinated on the stone, graffitied the plaster. But when the order came to burn down the place—the black British recruits refused. They’d take no pleasure in destroying this temple of freedom, though freedom was denied to them inside its very walls. 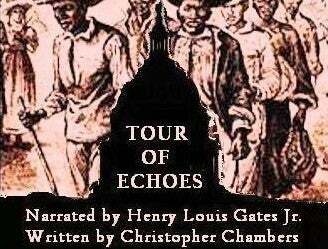 Yet grimmer echoes follow the tour, as another 1842 voice declares that slave catcher Edward Prigg wins his case against the state of Pennsylvania, and thus a fugitive slave mother— and her children born in the free state to which she fled—must be returned to slavery. From the Old Supreme Court chamber’s entrance, comes the Rotunda, where another man from Illinois, Abraham Lincoln, lay in a flag-draped casket, after having led a nation through its darkest hours—a civil war fomented by Taney’s words. The inaugural stage juts from the West Front Terrazzo, giving Obama a view of Pennsylvania Avenue’s parade stands and route. 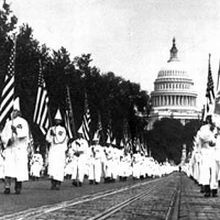 In the 1920s, within the lifetime of many elderly Americans in town for the inauguration, thousands of Ku Klux Klansmen (and women, children) marched proudly in full white sheet regalia under American flags, along this same route to counter reports of declining enrollment in the organization. Six years later, an integrated march of World War I veterans plied that very route. They called themselves the Bonus Army and demanded relief from the Great Depression. Along the present Anacostia Waterfront, they built a shantytown and shared food with black families who were there since the Civil War. Soldiers with bayonets, old-fashioned horse cavalry wielding sabers and newfangled tanks attacked the shanties and burned the marchers out. The black neighborhood was erased, too, for modern housing and office buildings. To the northwest from the Capitol steps, Obama will spy the spire of Georgetown University’s Healy Hall, named for the son of a slave, Jesuit Fr. Patrick Healy, who raised the college to its present prominence after he became the college’s president in 1874. Out of safety and necessity, he passed for white when alive, but his commitment to his community never waned. Around the spired edifice of Healy Hall unfolds the chic shops, cobbled lanes and august townhomes of Georgetown. The neighborhood was settled and occupied through the early 20th century by black artisans and laborers. Slowly the black residents were forced out of their enclave, not by the Klan or soldiers, but by gentrification and “urban renewal.” The same was true in Foggy Bottom neighborhood, where Hillary Clinton will direct the Department of State. From the edge of Georgetown and Foggy Bottom, over the expanse of the Mall and up to the inaugural state, centuries of echoes reverberate. Echoes from a century of cowbells attached to women and children in slave coffles headed for the auction and holding pens on the Anacostia and across the Potomac upon the now-toney Old Town Alexandria, Va. waterfront. Echoing, too, will be more triumphant voices from the past, those weary but determined and dignified thousands who filled in the space around the Reflecting Pool and the Lincoln Memorial on August 28, 1963, when Martin Luther King Jr. gave steely and undeniable voice to rights and aspirations of a people. From those distant shouts can be heard the sounds of fires burning across the city the day after King‘s assassination, the day the whole city burned black. These grounds, these meeting grounds, these people’s grounds now ring with voices as recent as those gathered in affirmation for the Million Man March in 1995. These will be the distant whispers, chants and shouts mingling in the ears of all assembled on Jan. 20, 2009. They will be the inaudible perhaps, but indelibly felt, as they echo in time with the contemporaneous words of Barack Obama, the 44th president of the United States. Here at the Capitol. Here, at the temple of freedom, built by those who were not free. Christopher Chambers is a Washington Post Bookworld and Essence bestselling author, and teaches journalism at Georgetown University.